Adding fruit to a peanut butter sandwich instead of jelly is a great way to decrease added sugar and increase your fruit intake. This recipe does not need to be made using pita bread, feel free to use any whole wheat bread that you have. You can also use any fruits you like! Cut pita in half to make 2 pockets and warm in the microwave for about 10 seconds to make them more flexible. Carefully open each pocket and spread a thin layer of peanut butter on the inside walls. 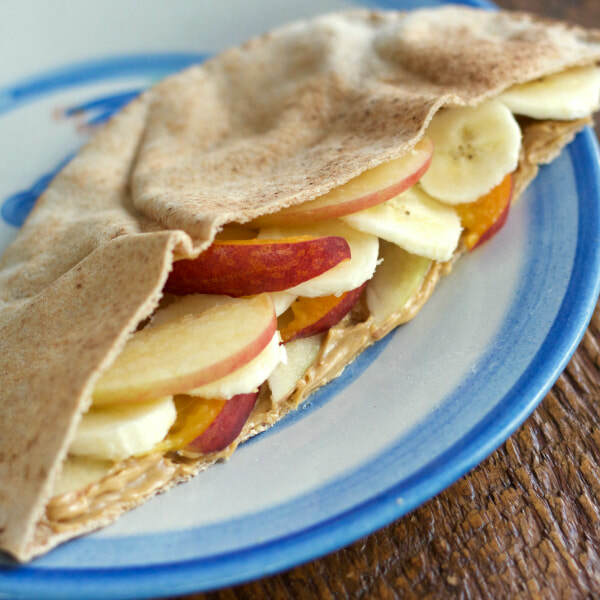 Fill with a combination of apple, banana, and peach slices.